← FAQ: How do I enable downloads, so that my tutor can print my work? FAQ: Why do I have to wait to edit the wiki? 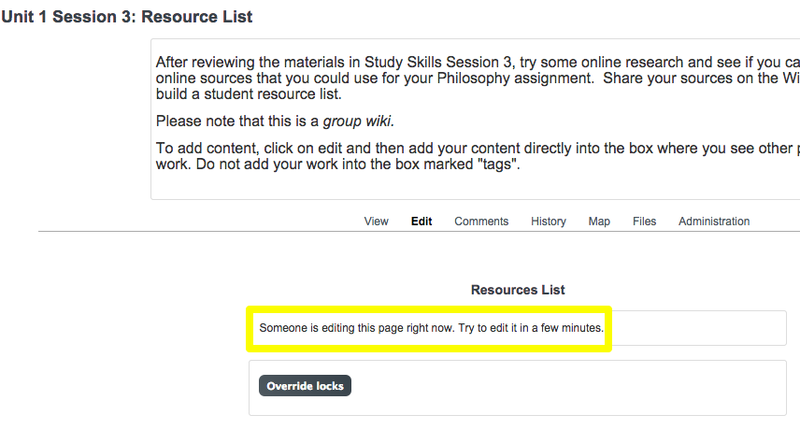 As with most wikis, your moodle wiki can only be edited by one person at a time. If you are trying to edit and get a message asking you to wait (Image 1), please close the wiki and return to it a little later. This just means that someone else is also trying to do it. This entry was posted in Uncategorized and tagged wiki. Bookmark the permalink.